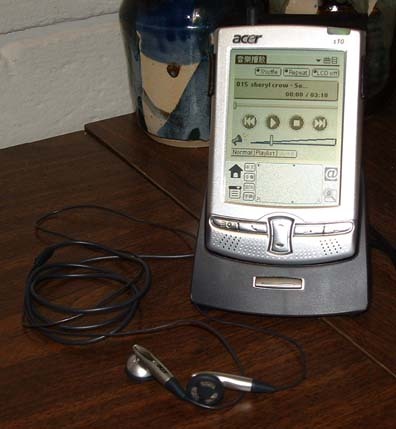 The Acer s10 is the first handheld to run a Chinese version of the Palm OS. It features MP3 and voice recording capabilities. 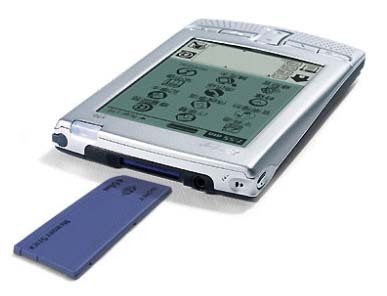 The s10 has a 160 by 160 monochrome screen, 16 MB of RAM, a 33 MHz processor, and a Memory Stick expansion slot. This model is available only in China, so if you don’t live in China, getting one of these might be a challenge. 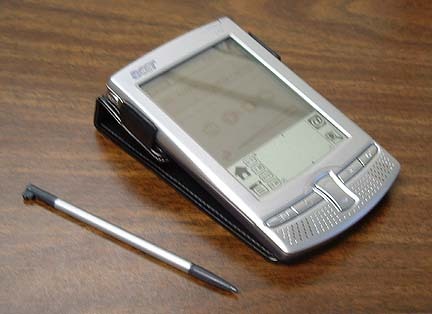 It has long been rumored that Acer plans to release an American version. The s10 isn't new; it's been available in China for months. The Acer s10 isn’t exactly small. 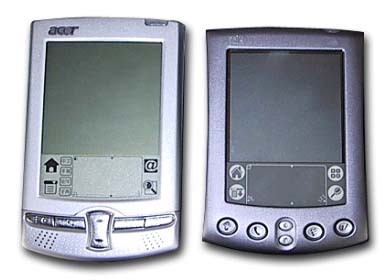 The casing is slim and long; about the length of the old Palm Pilots, although with far less thickness. To be exact, it's 4.7 by 3 by .5 inches. It weighs 4.9 ounces. The front side of the casing is metal and the backside is a rather glittery type of blue plastic. The buttons look a little cheap at first glance, although they’re very responsive and excellent for playing games. The screen is the standard size with a few extra buttons crammed into the graffiti area. In your hand the unit feels really light and has a tendency to slip away if you don’t use the flip cover. This is a leather flap which grips to the back with two pieces of metal. There is a hole in the cover for the headphones to pass through, and the record button can easily be accessed even with the cover closed. When the cover is opened it props the device up at a nice viewing angle. The stylus is slightly wider than the m500 series styli, and a bit longer. It weighs less than most metal styli, and includes a reset pin. One thing that makes the s10 unique from most Palms is the voice recording function. The record button is located on the upper left side; it can be pressed in any application and will take you straight to the recording application. Unfortunately, just tapping the button won’t work, you have to hold it down a second for it to start recording. Also, the button has a tendency to get in the way and get pressed accidentally. The microphone itself is placed on the top of the unit. It seems to be fairly sensitive, but it doesn’t pick up much background noise. You can hold it several inches from your face and still get decent sound, although you can’t use it very well to record a conversation. During recording and playback a red light will blink at you. The recording application allows you to customize the preferences to fit your needs. You can customize the recording hotkey so it is pressed to start and stop the recording or so it is held down until you’re done recording. There are also two options for data storage. The default setting is to store the audio in RAM as a .pdb file. When you HotSync the unit, there is a utility to convert those files to .MP3 on the desktop. The other option is to have the program store the file directly to the memory stick as an .MP3 file, very useful when you’re running low on space. One of the neatest features is the ability to play MP3s. In order to do this you must have a Memory Stick, I recommend one that is at least 64 MB. There is no included software to help install the files so, unless you own a card reader, adding music is a painfully long process. The AudioBox application has everything you would expect to find on a standard MP3 player: shuffle, repeat, loop, etc. You can rearrange the tracks from the play list and exclude certain tracks. You can set the LCD to turn off at a set time, or do it manually yourself. The entire unit can be put on sleep mode for either 15, 30, or 60 minutes. The quality of playback was surprisingly good. The internal speakers sound pretty similar to what you’d find in a standard laptop. The sound comes out a bit tinny, but it isn’t horrible. The volume is a bit too quiet though. I have gotten yelled at a few times at work for having it too loud, but in a crowded room the only way to hear it is to put it on max and hold it to your ear. The headphones, on the other hand, work wonderfully. The headphone jack is a bit smaller than standard, so if you don’t like the included ear buds you can't just swap it for another pair you have lying around. But when you do use the headphones the quality is excellent and the volume is great. The Acer includes a simple ebook reader with all the basic features. It isn’t great, but it has all the essentials and the toolbar takes up only minimal space. There is an included converter to turn nearly any type of text document into a .pdb file. The s10 has a rechargeable battery with excellent life. If you recharge the battery every night, odds are you’ll never get a low battery warning. Despite my nearly constant use of the MP3 player I haven’t received a low battery alert yet. There are three ways to charge the unit. Of course there is the standard way; plug the AC adapter into the cradle and leave the s10 in the cradle. You can also charge the unit solely through the cradle. If you don’t plug-in the adapter it will use the USB port to charge itself. The final way is to just plug the adapter straight into the s10’s bottom. The nice thing about having so many charging methods is that I can leave my cradle at work and my AC adapter at home and not have to worry about charging. This also saves a bit of space while traveling. Because the s10 is the first Palm OS device to use Chinese, they needed a little creativity with data input. Graffiti and the on-screen keyboard weren’t abandoned, but a few new methods came along for the ride, the most namely being an attempt at real hand writing recognition. In order to use Chinese characters a little on-screen window pops up with an area to write the characters. Once that window is up, you can tap an “A” to take you into English mode. Then you can just write the letters, how you normally would, on the screen. It’s a little awkward at first, and some letters just don’t work well. But punctuation is so sad it might as well be a joke. The area on-screen where you write the letters can’t interpret punctuation at all so you’re forced to use the Graffiti area for everything, right down to spaces. Really, it was a nice little add-on, but it isn’t extraordinarily useful. As always, there are a few more little things to mention. First off, the screen. The backlight on it is a light grayish-white and it contrasts very well with the screen. Also, the backlight does NOT invert the pixels. It is amazing how easy this makes the screen to read, and even in dim lighting it’s clear to read. Second, the calculator button . . . or lack there of. Instead of a calculator icon there is an @ symbol which takes you to an about screen. It can still be customized to other buttons, but the icon makes you think of email. The installation of this unit can be a serious pain if you already have a Palm installed. Also, the cradle isn’t very friendly for syncing. You can’t just tap the HotSync button, you have to press it firmly and hold it for a second before it will work. Finally, the Acer includes a few more convenient software programs. There is a nifty little clock program, with a handy little timer, but unfortunately there is no convenient shortcut to toggle it. There is also a backup program to save everything onto the Memory Stick and restore after a hard reset. The last mentionable program is the English to Chinese dictionary. It can be quickly and conveniently toggled to float over any application, or you can enter the main application for more choices. The Acer s10 is a nice, affordable solution for MP3 playing and voice recording. Although not color or compact, it certainly gives you a lot for the money both in terms of hardware and software. If the idea of a Chinese handheld doesn’t scare you and you can get your hands on one of these, it is definitely a great deal.